The CXR service tracks dozens of statistics on each child in your program. Our analytics show students where they most need to study for improvement. Students can earn scholastic chess titles for 22 distinct levels of achievement. Your kids get the most advanced chess metrics service available anywhere. Your students get overnight rating updates -- the fastest anywhere! Enthusiasm about ratings and statistics encourages kids to study. CXR's showcasing of kids' achievements encourages greater participation. We provide 3 reports for each child, focusing on different aspects of their progress. CXR protects children by allowing their identities to be "hidden". Your students can benchmark their progress versus scholastic players nationwide. CXR easily fits your budget with a choice of two, low-cost, pricing models. Parents will be glad to benefit from the lower cost of CXR. 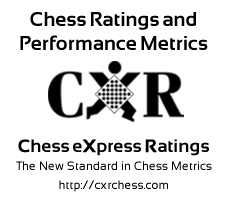 CXR Ratings are now being recognized for pairing purposes in USCF-run tournaments. *CXR's formulas recognize that most youngsters start out with little knowledge of the game, but learn rapidly, absorbing important concepts as they put them into practice over-the-board. Scholastic players rated under 1000 benefit from a slightly accelerated rating growth which continuously rewards practice and achievement. Other systems are frustrating to students, as their rating level does not adequately reflect their efforts. The lack of positive reinforcement leads to a high drop-out rate. CXR's formulas provide a measurable increase in rating as a reward for effort and learning. This has led to superior levels of achievement by students from our scholastic affiliates.